It was minus 7 but sunny and not much like spring at all. Having been at John and Richmond I had a short walk to Portland and Wellington to visit Victoria Memorial Park. On July 29, 1793, a detachment of The Queen’s Rangers under the guidance of Lieutenant Governor John Graves Simcoe arrived from Newark (Niagara-On-The-Lake) and began work on Fort York. This was the founding act of what would become the city of Toronto. Simcoe brought with him his wife Elizabeth and their seven children. They lived in a tent near Fort York until their home at Castle Frank was built. Katherine Simcoe was their youngest daughter, born on January 16, 1793, in Newark. By Good Friday in 1794 Katharine had been feverish for two days while she was cutting teeth. Before the day was over she would pass away. On Easter Monday, April 19 she was laid to rest in a small clearing hacked out of the bushes a little north of their tent. 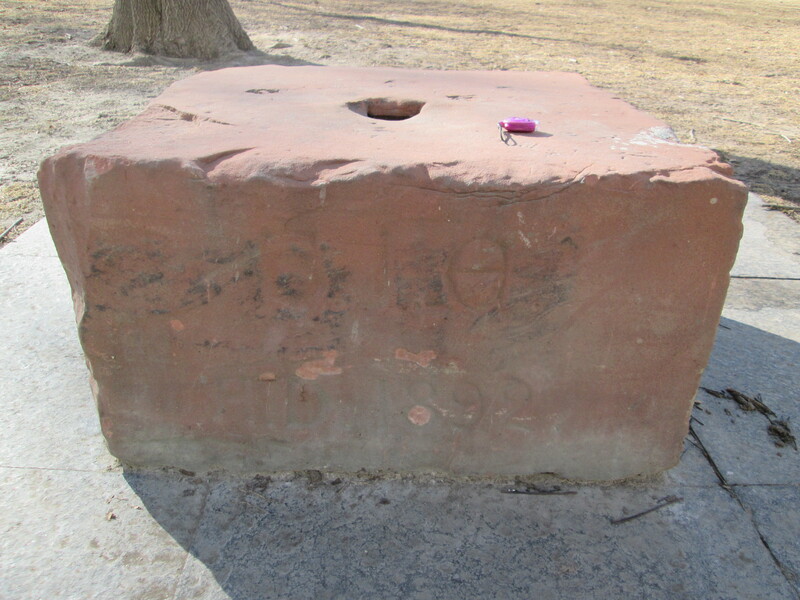 This was the first burial in the town of York (later Toronto). This small burial grounds would become the garrison burial grounds until it was deemed full in 1863 and closed. Casualties of the Battle of York on April 23, 1813, are likely buried here. Following the Battle of Stoney Creek in June of that year, the town of York became the hospital for anyone injured in the Niagara peninsula. John Strachan had become the civilian leader of York after the retreat of the British and the occupation of the town by the Americans. He presided over half a dozen burials a day in the summer of 1813. After the cemetery was closed it remained British Military property but was left abandoned and forgotten. In 1883 it was decided to transfer ownership to the city on condition that it be maintained as a public park. The cover picture shows the run down condition of the cemetery in 1884. 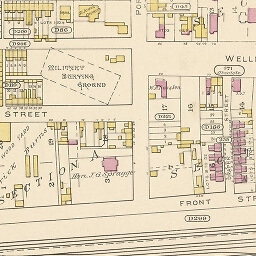 The Military Burying Ground is shown on Goads 1880 Fire Map but although Victoria Memorial Square Park is shown on subsequent maps the cemetery is omitted. The cemetery was laid out facing magnetic east so that the occupants could rise facing the sun on judgement Day. 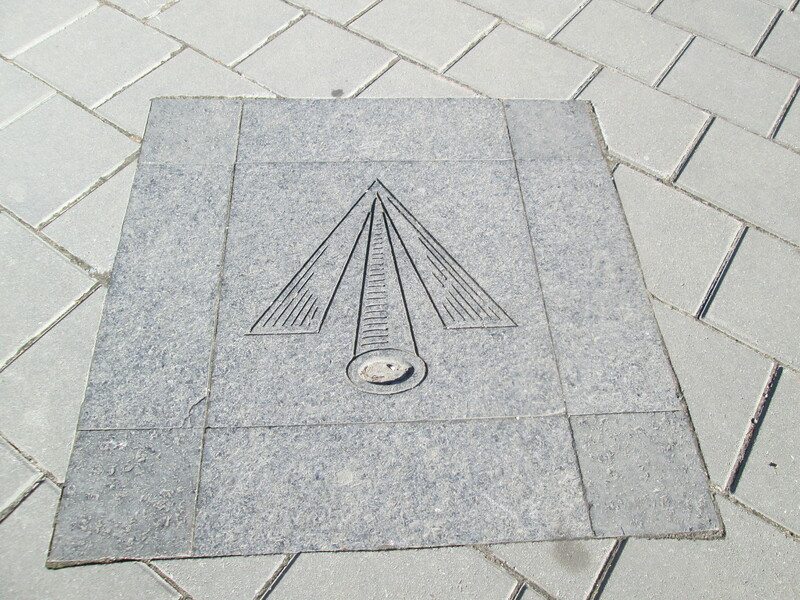 The old cemetery is marked with a row of paving stones that run at an angle to the sidewalk within the modern park. As early as 1883 there was a plan to put a cenotaph in the middle of the park to honour those who had given their lives in service to the military. A petition was made to local residents to identify any known burials in the cemetery as well as the regiments and companies represented. (The most unusual claim is that LTE. Col. Francis Battersby brought the horses he used in the Battle of Burlington Heights on July 13, 1813, to the garrison burial grounds and shot them. He preferred to bury them with honour than have them end up at a glue factory.) It took until 1902 before a statue was started and it wasn’t finished until 1907. The sculpture on top is called The Old Soldier and was created by Walter Seymour Allward. 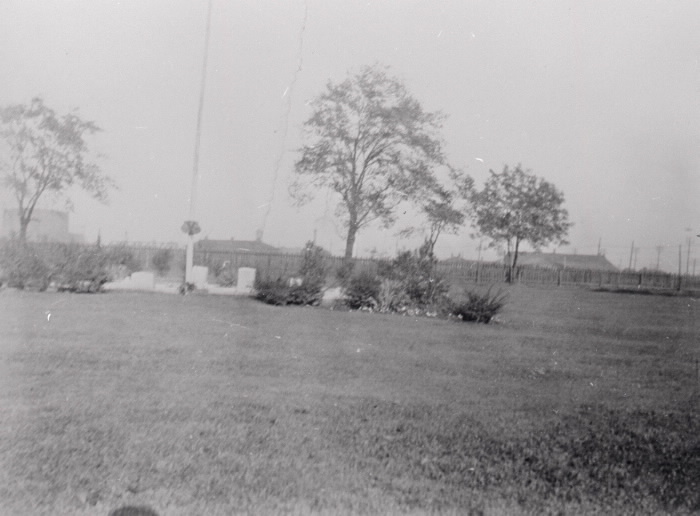 Allward would later commemorate Canadian war dead in France with his Vimy Memorial. Known as the Garrison Church, the Anglican Church of St. John the Evangelist was constructed in 1858 overlooking the burial ground. It was replaced in 1892 with a red brick building which stood until 1963 when it was demolished. The church was originally on the military lands but when Wellington Street was extended it cut the church off from the park. All of the literature I can find as well as the interpretive sign in the park date the church to 1893. The date stone is all that remains of the church and is a couple of feet from the sign that says 1893 but the stone clearly says AD 1892. I think we should take the one carved in stone as being correct. Broad Arrow symbols once marked the four corners of Victoria Memorial Square Park claiming it as British Military property. 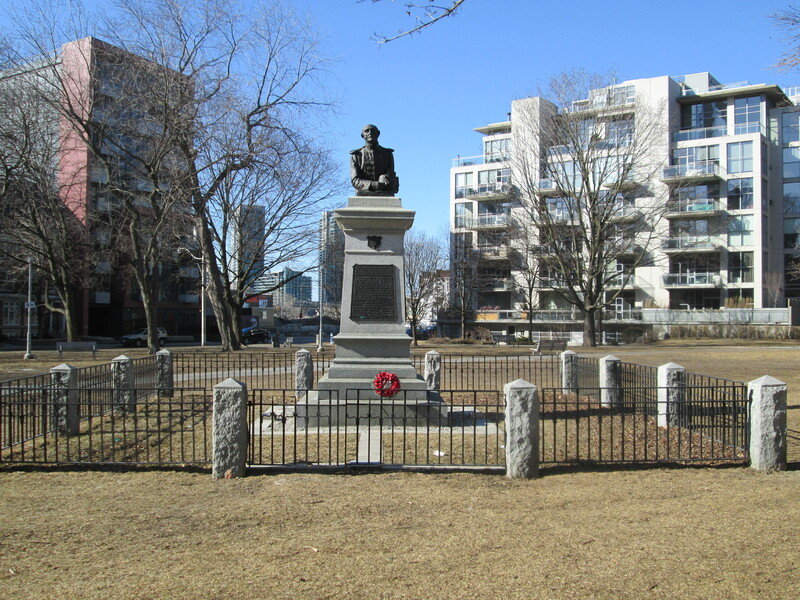 As a youth, Sir Sandford Fleming had surveyed Victoria Memorial Square Park and the military reserve around Fort York. Fleming went on to become the Chief Engineer of the Canadian Transcontinental Railway and invented our modern system of 24 time zones. I walked from the park down Bathurst street to visit the military cemetery that was used after this one was closed. 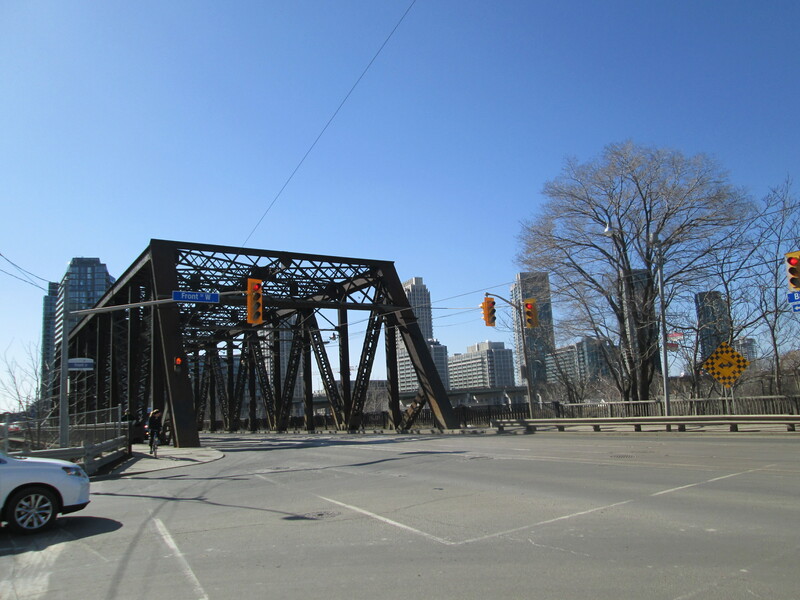 The steel girder bridge on Bathurst near Front street was built in 1903 to span the Humber River but has been located here since 1916. The chasm it spans contains more than what meets the eye. Under the bridge, and running along the east edge of Fort York, is Garrison Creek. The creek was the largest water course between the Humber and the Don rivers. Pollution and sewage led the city to bury part of Garrison Creek in the 1880’s. By 1920 the entire creek had been forced into the sewer system and much of the ravine above it was filled in. The bridge is named Sir Isaac Brock Bridge after the General who fell in the Battle of Queenston Heights on October 13th,1812. From Sir Issac Brock Bridge you can see one of the Community Canoe Gardens. This project aims to re-purpose 12 old canoes and turn them into bee friendly garden planters. 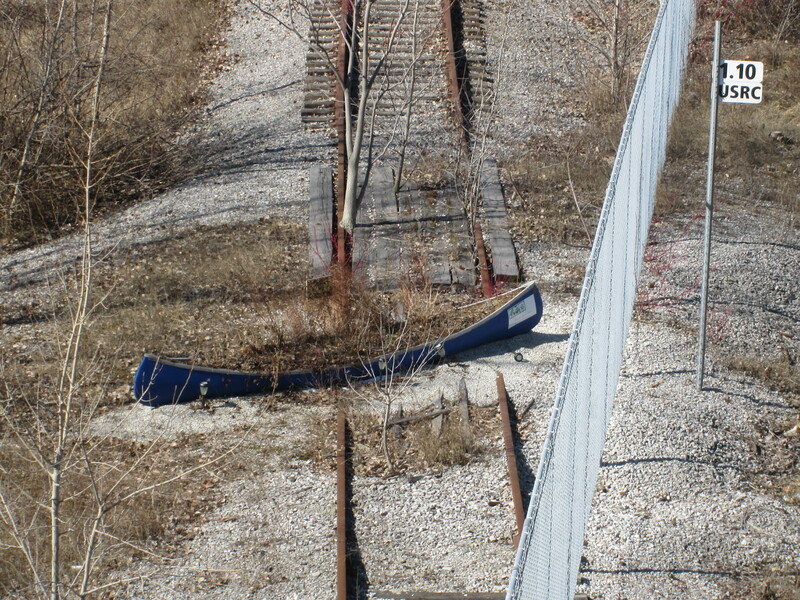 The canoes are to be located along the former water course of Garrison Creek. This one is where the creek used to flow along the edge of Fort York. 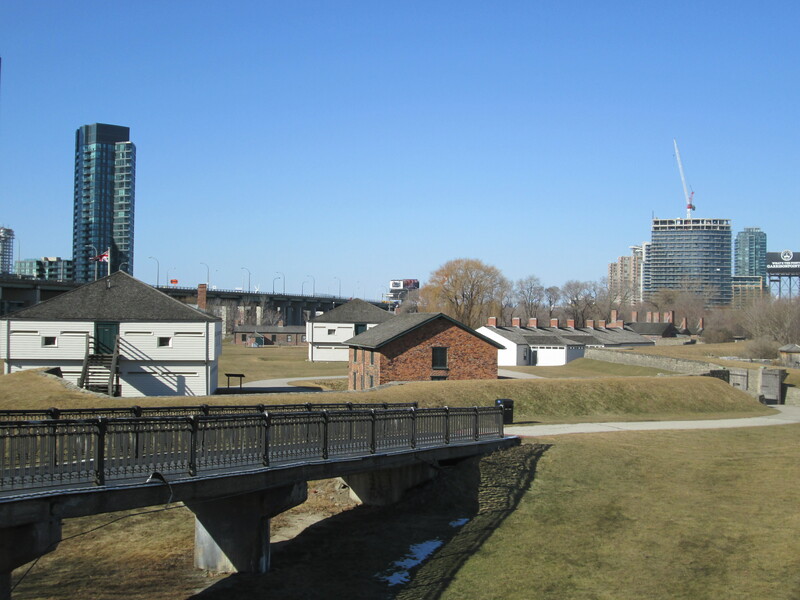 From the bridge, you can also see the east gates of Fort York. 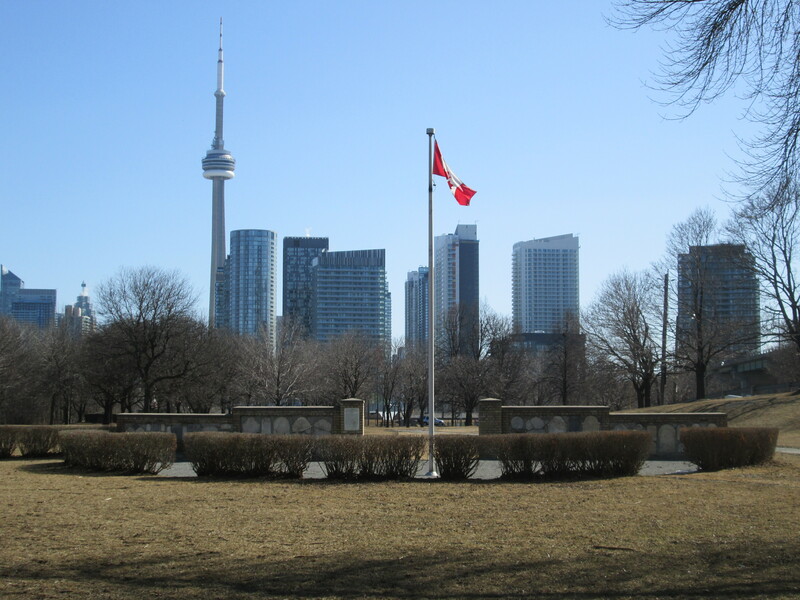 When the Military Cemetery at Victoria Memorial Square Park was considered full a new burial ground was selected near the New Fort on the CNE grounds. After less than a dozen burials this site was closed and the bodies removed to a location near Strachan Avenue at the west end of the Garrison Commons. 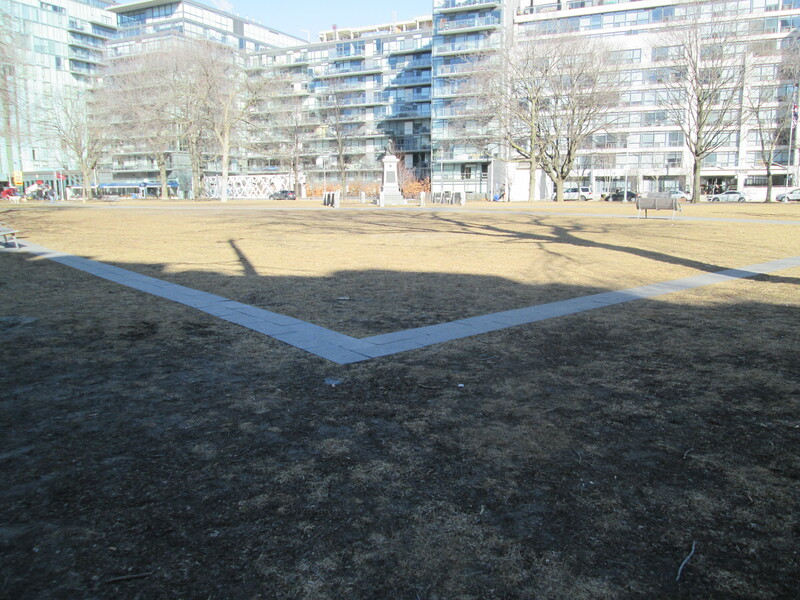 This had been the site of the American advance against Fort York on April 23, 1813, when the fort was captured and held for 6 days. This cemetery was used to bury the military and some of their families. It was closed in 1911 and the view below is from 1926 with the buildings of Fort York in the background. The view from a similar position today has an entirely different backdrop although Fort York is still there. Today, the two sites in Toronto where our fallen soldiers lie are largely forgotten by the people who enjoy the freedom that they gave their everything to preserve. This entry was posted in Garrison Creek and tagged Fort York, Garrison Church, Isaac Brock, John Strachan, Military Burying Grounds, Victoria Square Park on March 25, 2015 by hikingthegta. I wonder if there is any record of those who are buried here from the Battle of York , April 23, 1813. Thank you for sharing this.. Very important , I wonder if those who walk their dogs here realize what they are treading on? The Simcoes only brought their two youngest children to Canada and had Katherine while they lived here. The elder four daughters remained in England with a family friend. Many entries in Elizabeth’s diary mention collecting or drawing things to send to them in her next letters.